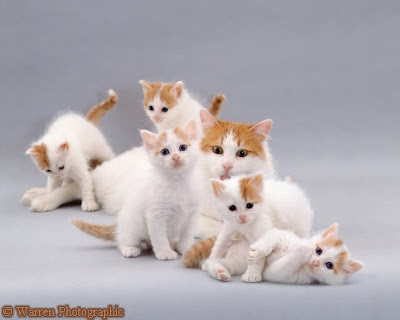 Turkish Van is a native long-haired breed of southwestern Asia. It originated from the rugged and remote parts surrounding Turkey's Lake Van centuries ago. 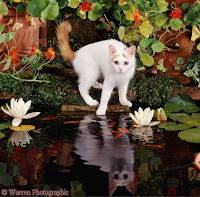 Initially known as Turkish Cat, it was subsequently named as Turkish Van to distinguish it from Turkish Angora, another feline of Turkey with whom the former is often confused. However, the two cats have differences in their appearance and areas of origin. Even as 'Van Cat' has resided for a long time in villages and towns in its native lands, it was brought to the United States relatively recently. As a result, this breed is still somewhat rare. A large muscular cat, Turkish Van is among the largest feline breeds, particularly in case of adult males who often cross twenty pounds in weight. Females are smaller. Coat is generally white apart from markings on head and tail, and occasionally on trunk. They can be blue, black, brown, cream and red in color and tabby or tortoiseshell in pattern. Eyes are amber, blue or odd-colored. Fur is soft like that of a rabbit, though it is dense and waterproof. It grows long in winter, with development of a neck ruff, and sheds to accommodate for the scorching summers of its native habitat. Chest and shoulders are quite broad and strong and alongside the wide pelvic girdle, add to the swagger of the cat's gait. 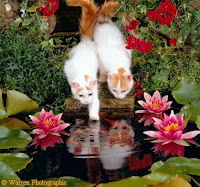 Perhaps the most remarkable attribute of these beautiful cats is their unparalleled fondness for water among felines. They are very fond of playing and swimming in water. Probably it is an evolutionary adaptation to the hot summer climates in their part of the world. In any case, these 'Swimming Cats' just love water, be it in a tub, sink or any natural water body. Intelligent and active, Turkish Vans are quite playful. Like some other breeds, they are often compared to dogs owing to their affectionate attitude towards people, bright personality and tendency to play 'fetch' games with their humans. These cats are quite famous for their courage and there are many tales of their bravery in their areas of residence. Turkish Vans don't have an undercoat and their hair don't matt and thus not require daily grooming. Owing to their independent yet loving nature, these adorable felines are darlings of many pet owners around the world who cherish them for their numerous wonderful qualities. Another important thing about them: They never steal (including food in front their nose). The book Bad Kitty Gets A Bath mentions them once or twice. its called the Armenian cat ! Lake Van is originally Armenian. I believe my cat, who was a stray, is a Turkish Van. He definitely "looks"
like some of the pictures I've seen. He is the whitest white cat I have ever seen.With Gold head, tabby fluffy tail & hind gold color also. He is also very muscular. As for being a water lover, I have not noticed that. was just diagnosed with Congestive Heart Failure. Does anyone know if this is a pre-disposition to this breed? He is also VERY Sociable with Humans. he is the unofficial greeter at our Village Post Office.